The ever perfect Courtney Johnson, heir apparent to precision tandems, wrote a marvelous account of the MTR. 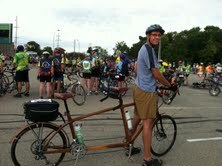 I was honored to be photographed in her blog as “these guys have a bike made of wood”. 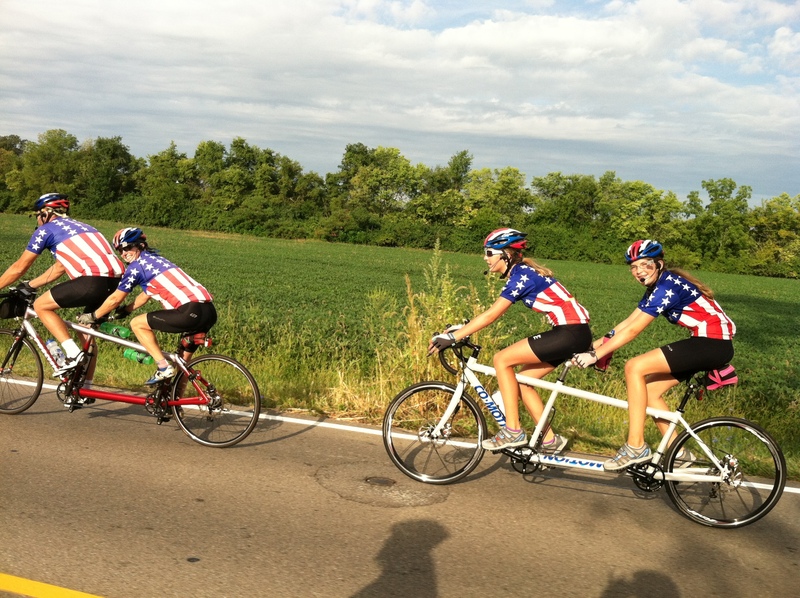 Here is the link to Courtney’s blog: http://www.precisiontandems.com/mtr2013/mtr2013.htm . Courtney and Natalie reminded us so much of our daughters, Ella and Sarah as they pedaled their maiden MTR in Shipshewana in 2010. Ella was seventeen and insisted that fourteen-year-old Sarah be the captain. This was our forth MTR and the first riding a wooden tandem. 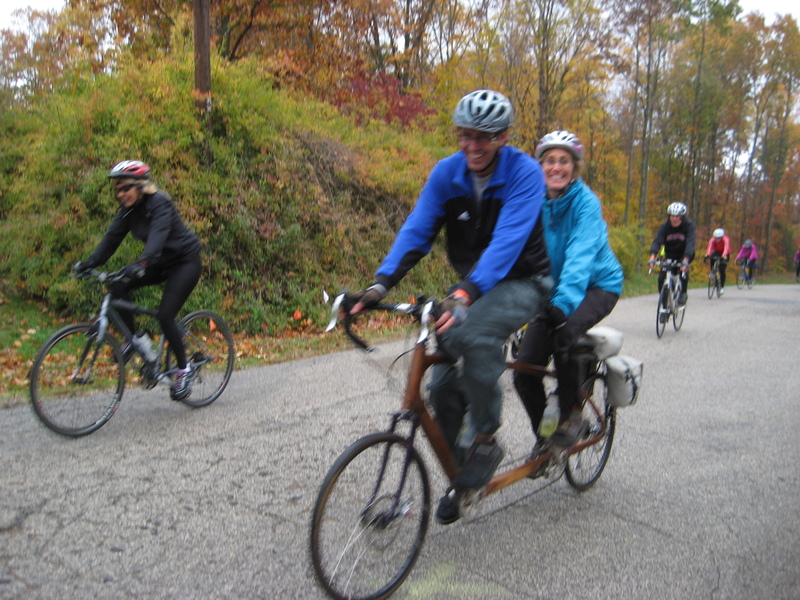 One can not be too bashful when riding a wooden tandem. I need to have a tee shirt printed with answers to the FAQs: It’s not bamboo, it’s black walnut, I made it myself, it weighs about the same as a comparable size and equipped aluminum framed tandem. It is hollow. It rides very smooth because the wood absorbs some of the road vibration. It was built two years ago and has made quite a few trips including the Hilly Hundred last year, and a self supported (loaded….camping) cross country trip with my son last spring. It takes hundreds of hours to build a frame. The “Goats” in charge of bicycle storage ogled over it and they made sure it was position in the room so others could ogle over it too. It got a lot of attention! Going to the bathroom was a challenge at the rest stops because so many folks wanted to talk about the bike. The highest compliment came from a guy who was riding a gorgeous Calfee carbon-fiber bike : “hands down the most beautiful bike on the ride”. The Goats did a marvelous job organizing the 2013 MTR. I confess I didn’t know what a Goat was before the weekend and now I’m planning to become one! I was hesitant to ride this year because I thought I would be riding the same roads that I always ride here in Greene & Clark counties. I was pleasantly surprised by a lot of different roads and some old paths that I hadn’t meandered in a long long time. Andrea and I were invited by Cedarville University and Formula Society of Automotive Engineers (FSAE) alumni, Nate and Catherine McLeese to ride with them on the Hilly Hundred. This was the 45th running of “the Hilly”, a bicycle ride in southern Indiana that attracts five thousand cyclists and covers one hundred miles in two days. As the name implies, the ride is known for its HILLs! The weather forecast for the weekend was stellar for cycling, mid-fifties with a 10% chance of rain on Saturday and mid-sixties on Sunday and sunny. The reality: Sunday’s prediction was accurate but on Saturday I would say that there was only about 10% of the day that didn’t rain. It was miserable and scary because the bike traffic was extremely heavy and the roads were wet. The paramedics were busy. We witnessed one serious fall on a steep downhill. I was singing praises for oversized disc brakes on my tandem bicycle because they worked very well, even when wet. Nate and Catherine work for Cummins in Columbus, Indiana so we commuted about an hour each day to the Bloomington area. We were physically and emotionally spent after the ride on Saturday. It was very difficult to muster the moxie to get back in the saddle on Sunday. It was cool enough Sunday morning to require windshield scraping but the sun was out bright and strong. What a difference the sun can make. The cycling crowd was giddy and the fall colors were dazzling. Andrea and I had an unusual set back about two miles from the first rest stop when our front derailleur cable failed. We were able to limp along in granny gear to the first rest stop and purchase a new cable. Note to self: always carry a spare, tandem-length cable. I had ulterior motives for riding the Hilly: 1) to torture test my wooden framed tandem bicycle 2) to get the word out about wooden framed bicycles. The outcome of the second objective was border-line embarrassing. We were constantly lambasted by comments like “Awesome bike!” “Did you see that?” “Wow!”. One can’t be shy and ride a wooden framed tandem on a big ride. It was hard to get food or go to the porta-potty at the rest breaks because of the constant barrage of questions. Catherine McLeese suggested that I print a tee shirt with all the answers to the questions: “Yes, it is real wood”, “The wood is walnut”, “It takes about two hundred fifty hours to make a frame”, “It’s laminated and has a hundred and seven pieces of wood in it”, “The wood absorbs some of the road vibration so it rides very smoothly”, “No, it isn’t heavy; it is hollow and weighs about the same as an aluminum tandem”. The Hilly offered some wicked torture tests. The temperature went from freezing to 70 degrees F. We had several hours of steady, penetrating precipitation on Saturday. I had a scare on Saturday in the rain. We were careening down a hill at nearly 40 mph when the road suddenly turned to washboard and potholes. I was pinned in by other cyclists, and I couldn’t brake hard because of the wet roads, so we blasted right over the hazards. It nearly jolted the teeth out of our heads but the bike didn’t miss a beat. A tandem is a great test for a material, in and of itself. Taking a tandem up 20% grades is almost beyond the call of duty for any material. The wooden tandem handled it all very well.